PM502 comes in a very modern and user-friendly design. It combines finest analogue input circuitry and operating surface with the advantages of its digital master and amplifier section making for a new dimension of flexibility in its class. The acoustical performance meets everything that you have come to expect from a quality Dynacord product. The input structure of the PM 502, along with the entire feature package and connectivity, positions this mixer at the heart of many installations ranging from Bistros, small clubs, lounges, boutiques, hotel bars and lobbies to churches, mosques and a wide range of similar applications. 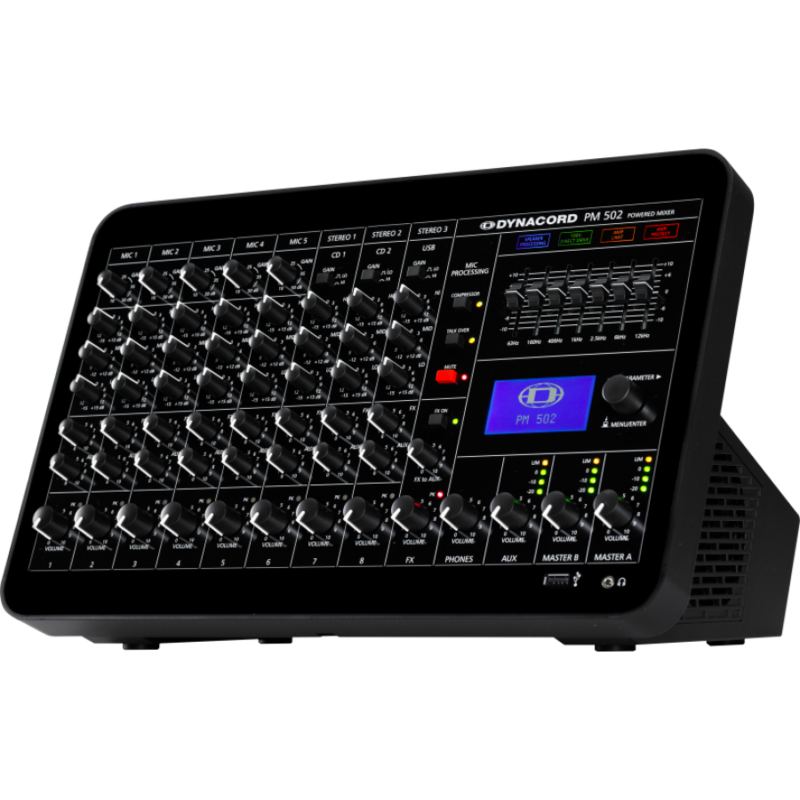 Further the PM 502 is an extremely versatile tool for a multitude of live applications. It will be the ideal choice for entertainers, DJs and small bands looking for a compact and light-weight solution for live applications or rehearsal venues. The onboard MP3-Player on the front, allows the user to easily play pre-recorded music from a USB stick or a hard drive. The digital USB interface on the rear also allows for basic recording. 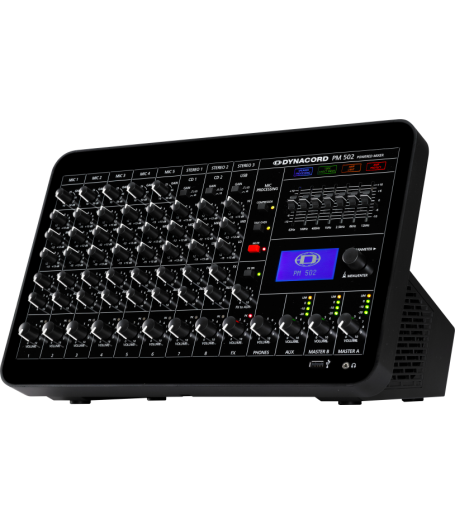 Its feature package includes: 5 MIC/LINE input channels with compressor / limiter and talk-over function, 3 Stereo Inputs including Jack, RCA and USB connectors, onboard player for MP3 or WAV audio files, high quality effects section with 32 editable presets, 3 Master outputs with 7-band EQ each and flexible signal routing options, delay line for Master-B (150 msec / 50m), headphones control, LPN speaker processing, class-D amplifier with 2 x 600W / 4 Ohms IHF-A ( 2 x 450W continuous) power, micro-controlled power supply (100V - 240V), Direct-Drive option for 100V speaker lines, comprehensive protection package, live and install connectivity, and an optional rack mount kit.